Every day children participated in a bible story, games, and crafts. There was also a drama performed every day by some of the leaders of holiday club. On Wednesday the story was about Matthew the tax collector. We learned about how Matthew really was a “bad guy” and he was definitely not popular among the Jewish people, but Jesus chose him anyway. This story focused on a theme of “wider and wider is the invitation to follow Jesus”. We talked about how God’s love is so wide that He came for everyone. Then we participated in a game outside that was similar to capture the flag, but with cardboard boxes that were made into machines that fit the theme. The craft on Wednesday was baking scones. Each child got to make their own scone to eat later, and the idea was that they could see how the scone got bigger once it was baked. 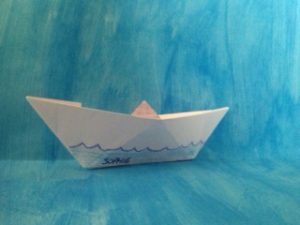 On Thursday the children heard the story about Jesus being asleep in the boat while his disciples were enduring a terrible storm at sea. When Jesus woke up and then calmed the storm we looked at how the disciples did not have complete faith, but Jesus calmed the storm anyway. 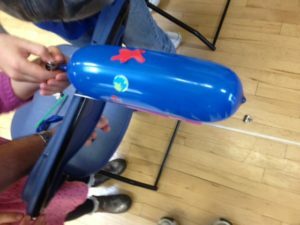 The theme for Thursday was, “deeper and deeper is our trust in Jesus.” The children got to play with the giant parachute, and they played a fishing game where they had to pick up bits of a machines that had supposedly fallen apart. The craft was making an origami boat that they got to colour and decorate. The children loved watching the drama at the end of every day. They got to participate by shouting and cheering to interact with the actors. 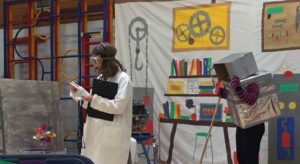 The drama was a story about an inventor, Professor Eve Ventor, and her machine that her new apprentice, Dr. Upton O’Good, tampered with. Another one of the inventor’s inventions, ROBOT, gave herself up by becoming part of the machine so that the machine could work again. In the end everyone wanted to tell others about what ROBOT had sacrificed for them. The story was a great way to tell the story of Jesus’ sacrifice through a fun drama.